Department of Urology, San Bassiano Hospital, Vicenza, Italy. Diffusion and availability of new imaging techniques have improved early diagnosis of malignancies over the years. Regarding renal cancer diagnosis, in the last two decades, there has been a rise in the incidental discovery of renal masses with an increase in the identification of small ones. The more frequent diagnosis of localized renal cancer has enhanced the rate of nephron sparing surgery and new minimally invasive approaches and alternative techniques have grown (i.e. laparoscopic and robot-assisted nephron-sparing surgery). However, considering that early and effective treatments have not impacted renal cancer related mortality, a significant number of localized renal cancer might be currently overtreated. Furthermore, surgical approach is offered in a high rate of benign masses without improving survival but giving only potential comorbidities. Currently, surgery represents the gold standard treatment for renal masses, especially in young and healthy patients with localized lesions. However, in the last years, focal therapy has gained more attention. Radiofrequency ablation and cryoablation, performed via open, laparoscopic or percutaneous route, are now considered an alternative therapy in a selected cohort of patients, typically older, unhealthy patients or for those who refused surgery. 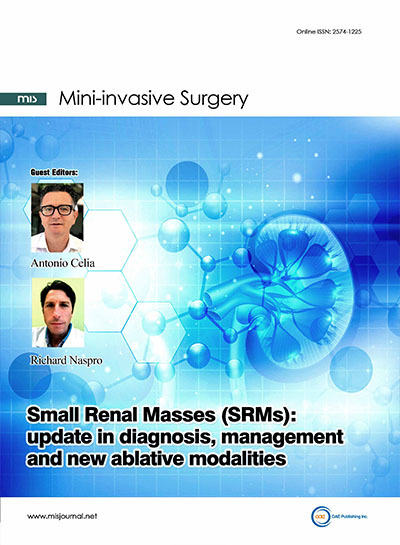 Purpose of this special issue is to highlight all aspects of the management of small renal masses, from the imaging to the surgical and non-surgical strategies presented by experts.